Hi poets from all across the globe! I’m back from a winter hiatus up in the far north, with snowstorms and being weather locked in remote cabins. Spending your time without electricity or coverage let you focus on the essentials of being human, like food, warmth and company. Now I’m back with a little bar-talk, where we are trying to give you poetry from different parts of the world. Just before I left for the mountains, one of our great Swedish poets died, and if you are living in a country that seemed devoid of poems in everyday life it was amazing to hear his poems being read on the radio many times per day. 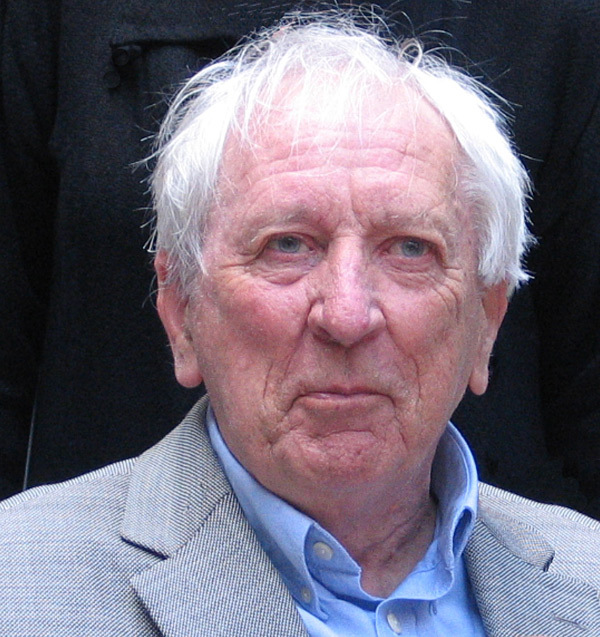 I am of course talking about Tomas Tranströmer, our latest Nobel laureate. It can often seem like giving the Nobel prize to a Swede is a little weird, but this time it seemed like the respect of him as a poet made very few mentioned nepotism. Tomas Tranströmer was a loved poet. He was born in 1931 and combined poetry writing with being a practicing psychiatrist and translator. His poetry often combine the mystery of life with with everyday contemporary metaphors. You can read more about him here. What I find myself is that his poems often translates very well into many other languages (over 60 languages), and is considered one of the most influential poets from Scandinavia in modern times. There has to be a reason why his poems translates so well, and to me it is obvious that his use of metaphors and images that are both simple and stunning at the same time, makes the meaning apparent across language barriers. Many of his poems have been translated to English by Robert Bly. The lines about the pages torn from old telephone directions for instance are so vivid in connection to the sorrow one feels after the death of a close friend. After a stroke that left him partly paralyzed in 1990 Tomas Tranströmer wrote mostly shorter poems, and have made contributions to haiku poetry by incorporating his unique imagery and have injected inspiration all the way back to Japan. Oak trees and the moon. So today’s subject for the bar: How do you come up with those stunning images. similes and metaphors? How do you create them? and how do you refrain from using them as tropes? How do you avoid metaphors that seem constructed or artificial? Let me start to tell you what I often do. I start with a word and thinks around it.. what could it represent, what aspects can I see?.. how can I combine a noun with a verb, how can two noun interact to create something new. Sometimes it works, and sometimes I just have to try with a new word. 1st of all, thank you for opening my eyes to this amazing poet. a “box” also, “gold pour box” is a piece of art from Nancy Lorenz. as they bring life into this world and keep it going. so I went for a more vulgar route to reflect that as well. to lean towards things just because they sound catchy, which I have done. Oh yes I remember that one Anthony.. to create metaphors requires a lot of work, and it’s a delicate balance. Nature is actually very hard to use as metaphor. Maybe an exercise to use something completely different would help… sometimes. I agree that Grace is a master of metaphors. I agree, nature is appealing but hard to use in metaphors as it’s been used so many times before, it’s hard to think of something fresh, that doesn’t sound cliche! Really fond of this poet – thank you so much for this tribute to him! I actually did an exercise of translating him from a literal crib – A Page of the Night Book – on a poetry course. I remember he says at some point that grass and flowers were gray but the smell green. That really stuck with me. He has a wonderful ability to make you see the world afresh. I love those tree branches heavy with snow, like pages torn from old telephone directories. A green smell in a gray word really works for me.. So interesting that you have translated him.. I hope it worked well. Thank for sharing his poetry, a true loss of a poetic voice for those of us still earth bound. Metaphors – they can be a challenge for me. I try to let the images and words find their connections in my mind before I commit them to something more visible, more tangible. Does that make sense? I also try to find cultural links, and connections my son makes. I tend to rely heavily on similes, & the metaphors just kind of slip in the side door of things. As I write, mostly from a prose base, the line breaks, internal rhythms & rhyme schemes grow out of the creation of the shape of the piece. Lines, even stanzas rewrite themselves as the poem sprawls creatively all over the page; always very exhilarating to me; something learned from Brian over the years. I think effective metaphors are those which can be grasped immediately by the reader. So true.. yes I which is probably why Tranströmer is actually very popular (at least in Sweden).. his metaphor are very easy to understand. An interesting subject today, Bjorn. I really had never heard of Mr. Tranströmer before you mentioned him after his death; but I do like the poem you shared today. As far as using similes and metaphors, admittedly I use them if they occur to me and don’t use them if they don’t, for the most part. Occasionally if I have a lot of time to play with words I will try to work more with figurative language. If I cannot write an ‘understandable’ metaphor, I would rather not use it. And if I have to struggle too hard to comprehend metaphoric writing, it becomes work rather than enjoyment. There definitely is an art to writing metaphor….it is something that really needs to be developed, I think. And it is not easy! I agree it is hard to make it non-cryptic. But yes, when you find a metaphor that works well, one really feels successful. I think we all have to be open to stretching ourselves a little bit. Yes, finding metaphors that might not have been intended is interesting. Sometimes I think a person might write on one level, not even realizing that he/she is writing metaphorically on another level. Sometimes I think we can even discover metaphors in our own writing that we did not realize were there. I think that metaphor allows us to create in our words enduring pictures. Thus we can avoid being cliche and rote. That’s always the challenge, what is it in your own words. Your sample poems of his were brilliant – especially the haiku. To write powerful haiku is harder than one believes. Bjorn your winter break contains at least 5 things on my 100 list… snow,cabin,solitude, fireplace(I’m assuming), time to think…. I yearn at thought. A great story of a psychiatrist becoming a poet.. we do need more poets.. overall.. in the field of medicine. ah, I have to inspired to write without thinking… more in the habit of just writing and not waiting for it nowadays. when his wife moves ‘his bricks out of line’ a few years back.. I have found that I don’t use metaphors that much in my poems. Writing haiku as my major poetry form, it gets one in the habit of not being so…expressive? wordy? more forthright? As part of opening myself up to different poetic forms or ways of expressing myself, I find metaphors are needed. I have been practicing metaphors. Smiles. I pick several words and then do a list of literal descriptions and then, as if writing a riddle poem, I pick a word and try to find other ways of describing the object without actually saying the word. dVerse Poets has shown me so many talented writers and their use of metaphors – just amazing! I looked up Tomas Tranströmer after reading this post. Such a wonderful talent! And the Nobel prize truly seems an insignificant award after reading some of his works. And to be caught in storms without connections and electricity – Bjorn, it seems an amazing holiday. I have a feeling there are all kinds of images and thoughts that will come from that experience. I really don’t use metaphors that much either, as I mentioned above. I somehow think many of us develop our own styles, which are unique to each person. My granddaughter wants to read with me right now, so I will continue later. Smiles. I enjoyed your comment here…and will continue mine. Lovely! Reading with your granddaughter. A friend of mine daily reads with her granddaughter and considers it her most important and rewarding “job” at this point. I remember my grandmother reading with me with much fondness. I do like the way you practice with metaphors. It can help expand your writing for sure. Picking a word and finding different ways to describe it without actually saying it sounds valuable as well. If a person would do one or two each day, it could not help but improve one’s poetry! Smiles. She loved reading Shakespeare and would be all the parts. It was great fun. When I turn six, she got me to start reading to her. ,,, I hope my practice will come in handy. it is fun at any rate. My grandmother was a teacher, and granddad was a headmaster. But grandma did not speak English so well, so when I was about 11, I was her official translator for the Peyton Place weekly TV Drama, starring Ryan O Neal! I do not use metaphors very often either, or at least not that I am aware of. It isn’t really my “style” although I did use one or two in the villainelle for dVerse. Some poets are brilliant the way they use them and not heavy handed at all. Makes me tilt my head and ponder a bit. I read about his death in our local paper–he was unknown to me before then, so I’m so glad you shared him with us. For me, metaphors are all around us, they come from daily life…nature, objects, people, just about anything. I think, as poets, it’s important for us to look for them, jot them down when they appear. For me, they are equally important in writing fiction. Victoria, I do like the idea of writing them down as they occur. Perhaps we should all carry a very small notebook with us. I actually also find ideas for metaphor in prose I read, and when I was away I scribbled down a few ideas that I later used. Excellent idea, Bjorn. Jotting down ideas as we read is a great idea! Thanks, Bjorn for sharing about this poet with us. And, your time away in the mountains sounds great….to be in a remote cabin reminded of the importance things of being human….lovely. I have nothing to add to the conversation about metaphors because I am so far behind all of you in terms of poetry and ‘the craft’ so simply just want to say how grateful I am to all of you for what I learn from you in terms of how you think ad process and create. Thank you for sharing from your experiences. We all learn from each other. Some love metaphors and other have a fascination for story-telling,. That’s what I love with a community like this. I just realised I got carried away with Tranströmer and forgot to reply to the question about the metaphors. I don’t deliberately set out to create metaphors, as I work mainly auditively. I always start out with a phrase or set of words which intrigue me, which sound right, and then build the poem around that. Sometimes I try to carry through that particular image so that I don’t mix my metaphors within the same poem, but at other times there is no obvious link. I like the idea.. we had ideoms at one point in the past, but I think mixing them like that would be a new twist to it. I just finished reading The Girl with the Dragon Tattoo by Stieg Larsson and enjoyed it immensely. I always try to read at least few books a year that were recommended by my daughters, and this was one of them. So I shall officially make this week my Swedish appreciation week – thanks for the intro to Tomas Tranströmer ! so we grow up with these metaphors or idioms really. Fascinating use of metaphors in daily lilfe. And I like your explanation for the abundance of them. That is certainly true, I find, of Japanese language and literature, which is full of old metaphors that have become almost proverbs, they get repeated and referenced, perhaps slightly adapted or modified. For instance ‘wisteria flower’ is a symbol for unrequited love, wet sleeves are a metaphor for sorrow and suffering and so on. Actually I think that Swedish people are a little Asian .. Maybe you would say shy, so we have many metaphors.. And a long tradition to talk indirectly.. and when used enough they can become idioms… Love the examples that you share. Welcome back south to the land of Spring. I subscribe via WordPress, all I got was a picture, no text? Ah.. do you read on a mobile device?